Hoffman 90-degree Flush tee features steel construction and ANSI 61 gray polyester powder paint finish. It has a dimension of 8-Inch x 8-Inch x 10-Inch. 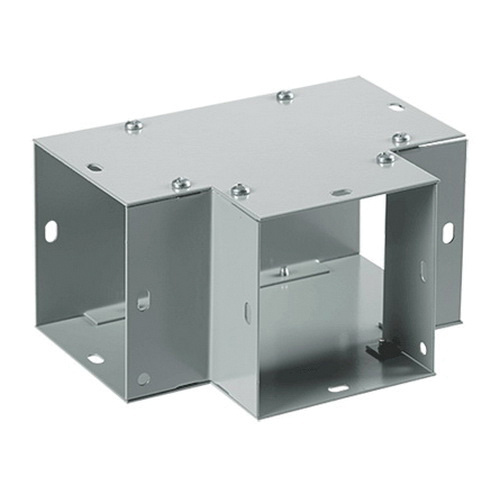 This IP30 rated elbow with NEMA type 1 enclosure, mounts against a vertical or horizontal surface and is suitable to use with lay-in wireway. It is rigorously tested for dust infiltration, thermal cycling, salt fog corrosion, vibration resistance to assure proper functioning. Tee is UL/cUL listed and CSA certified.